The traditional work of War Resisters’ International on supporting imprisoned conscientious objectors and other prisoners for peace may perhaps appear routine and grey, but it is as indispensable as it is challenging. As one who once was on WRI’s Prisoner for Peace list, I can testify to the importance of the scores of support messages I received from people all over the world, and which lifted my spirit when I was behind bars. Often, the stakes are set higher. This is the case with Egyptian conscientious objector Maikel Nabil Sanad, who is currently imprisoned for publishing an article criticising the Egyptian military on his website. He has been on hunger strike since August the 23rd -that's 84 days in total. Ever since Maikel Nabil Sanad first contacted us regarding his intention to refuse enlistment, and especially since his current arrest, the WRI has been working intensely on his case. Andreas Speck, who runs the Right to Refuse to Kill programme from the WRI office, has visited Egypt three times (on one occasion together with another WRI activist, Igor Seke) to attend Maikel’s trials, empower and encourage his friends and family and bring Maikel’s case to the attention of human rights groups, the media and diplomats. WRI was always the first international contact for Maikel’s small group of supporters in Egypt and our work was crucial in organising support for Maikel himself and putting pressure on the Egyptian military authorities. This effort goes beyond ordinary political or human rights work. It stems from true ideological and emotional commitment. Our efforts have so far led to the annulment of the original sentence of three years in prison, given to Maikel by a military court, but not yet to his release. We do not yet know if we will succeed in getting Maikel freed before his health deteriorates beyond repair, and we urge you to check our website for updates and to support Maikel Nabil Sanad. Another case which the WRI focused on this past year was that of British conscientious objector Michael Lyons. Michael's conscientious objection claim was rejected, and he is currently serving seven months' detention for “wilful disobedience” because he refused to participate in pre-deployment weapons training. Apart from individual support, the WRI also works to promote the legal recognition of the right to refuse to kill. This year, our intervention was instrumental in a ruling by the grand chamber of the European Court of Human Rights, upholding the right to conscientious objection under the European Convention on Human Rights. War Resisters' International contributed to this important judgement through a third party intervention at the European Court, jointly with Amnesty International, Conscience and Peace Tax International, the Quaker United Nations Office in Geneva, and the International Commission of Jurists. With this intervention, the organisations continued their cooperation that already contributed to the recognition of the right to conscientious objection by Colombia's constitutional court in October 2009. But, of course, legal recognition for the right to conscientious objection is merely a means, one among many, to an end. The end is ridding the world of war and militarism and of the suffering and injustice they carry with them. This, in turn, will only be made possible through the rise of a strong global movement working everywhere for, and through, peace and nonviolence. Building and fostering this movement, be it in Egypt, in Colombia, in the UK or anywhere else, is what all spheres of WRI’s work are focused on. We are writing you because this work needs your support. It needs your support in taking action on behalf of prisoners for peace, and not least, it also needs your generosity. 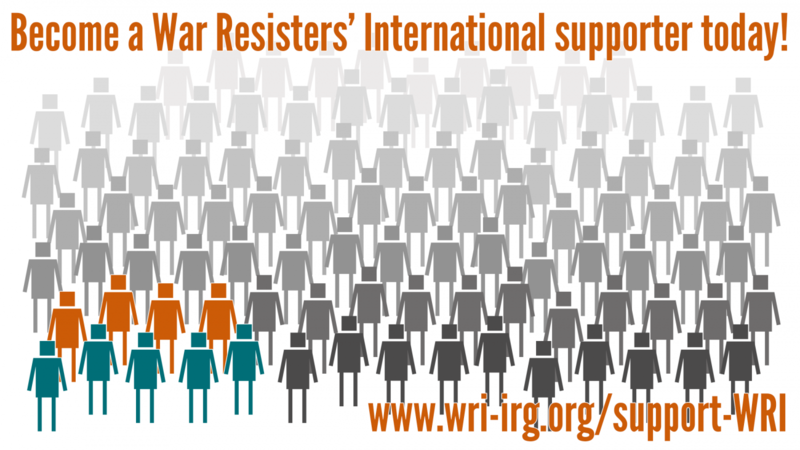 By giving generously to the War Resisters’ International you will help us keep this vital work going.